Poveglia was the start of everything. Katie sat on her cot with the files open in her lap. Her dad’s safe was right where he’d always kept it, hidden behind the freezer storage. The numbers were the same and it opened on the first try. Inside, she’d found hundreds of folders full of papers. She expected to find his financial records and house sale stuff along with what he’d told her to search for. She’d expected to spend hours rooting around, sifting through the data of their past. Maybe she’d find old photos too, ticket stubs when he’d taken her to see Finch in concert. There was nothing in these files that connected him to her in any way. The entire safe was full of personnel and identity records, transfers from one unrecognizable series of numbers to another. Classified locations, she thought as she’d set them aside. She remembered her dad telling her about scrambled GPS coordinates he’d used as a Ranger. In that same file, on a separate piece of paper, was a collection of notes about virulence and strains. It didn’t make much sense to her, being full of incoherent formulas and terms like Lyssavirus genus and ribonucleoprotein. She’d ask Lindsay about them later. She’d always been good at biology. A letter-sized print out of a map was attached to this, showing a topographical layout of a small island. After comparing some other notes she’d found, she decided that this was Poveglia. At first she’d thought Poveglia was some kind of virus or company maybe, but no, it was an island off the Italian coast. Sick people had been quarantined there years ago, left to die so what they had didn’t spread. In that same collection of notes she found references to experiments done on the island in 1943 by German scientists. The term “Null-Ereignis” was circled. She had no idea what that meant but committed the term to memory. Later, she’d ask him about it. She’d have time later. In another folder she found more references to Poveglia with letterheads from Kurama Pharmaceuticals. In it she found notes on experiments, their dates and findings. It was there that she found her first notations about the H1Z1 virus. There’d been cases of it dating back as far as the 1960s. The 2009 “hoax” was also listed. She vaguely remembered that news report. Something about Cambodia and troops and zombies. Only it wasn’t a hoax. Kurama took “samples” from Cambodia that were taken to Poveglia. Worse than that, she found notes on the 2014 release of Kurama’s vaccine program. As she read, she felt phantom pains from when she’d received the injection. It had been painful and she’d felt flu-like symptoms for days afterward. That was the last time she’d been sick, too. The more she read, the more she began to realize that was no coincidence. Oh, my god, she thought as she held a sheet of paper with a shaking hand. Kurama used the H1Z1 virus to create their “cure all” vaccine. Why am I not sick? Why aren’t we all sick? The thought nagged her and she forced herself to keep reading, to dig deeper. It got worse, so much worse. They’d known about the virus, about its effects, about what it could do and they’d covered it up. Not just them but the government as well. The military. The CDC. Everyone. She found references to the vaccine in a letter to the CDC director in Atlanta, stating that they were working on a cure. But on another sheet, it listed a notice to all Kurama Pharmaceutical employees that the Poveglia facility was being shut down. Before he’d begun to make the shelter. That wasn’t all. There were dates that coincided with when her dad went off with Bill “hunting” or “training with his old army buddies.” Sometimes he was gone for a week. Katie remembered those absences very well. She found that he’d been deployed to Mexico, Cambodia, Peru and a number of other places. All it said about the missions were that they were “quarantine” operations. She felt a sudden anger rush through her and she stood up, wanting to throw the papers onto the ground and stomp on them like a child might step on a broken toy. He’d lied to her! He’d lied to her and mom! He’d known about all of this from the start and he… he… He trained you to fight it, she thought, slumping back onto the cot. Suddenly, she felt like crying. Everything she thought she’d known was one big lie, a lie that was now burning up the world. Had Kurama unleashed this on the world or merely tried to contain it? The answers might be in those files but there were so many. She’d spent the last day just trying to understand them. Standing, Katie went into the pantry and began to brew some coffee. Most people used the drink to wake up but Katie always felt calmer when she was holding a warm cup of coffee in her hand. Drinking it helped too, but it was merely sitting with a fresh brewed cup that did the trick. While the coffee brewed, she ducked into the radio room to check on Lindsay. Her friend was hunched over the CB radio, her head on her arms, fast asleep. Lindsay was up all night trying to contact this Zach Evans without much luck yet. The radio waves were a mess and the connection had cut out sometime that morning. That didn’t stop Lindsay from trying anyway. Katie retrieved a blanket from the living quarters and returned to drape it over Lindsay’s shoulders. Her friend stirred but didn’t wake up, which Katie was glad for. Katie silently hoped they hadn’t missed word from her dad since Lindsay was using it all the time, but the radio went two ways right? Wished I’d taken more of an interest, she thought, considering how her dad had always tried to teach her how to use it and repair it. The CB never held much of an interest for Katie. She preferred to spend time with her dad out in the wilderness rather than talking to other people. Other people were why she ran back here so often. Crossing back into the living area, Katie briefly thought of those she’d left behind in New York. Well, of one person she’d left behind. They hadn’t parted well. It had been full of tears and pleading and yelling. Not much different than how she’d parted with her mother. She felt a pang of guilt at that. Was her mother even alive? Was New York overrun? She found, to her disgust, that she felt almost nothing in regards to it. No longing, no fear, no apprehension. When she tried to feel sorry for her mother, it wouldn’t come. “The hell…” she said aloud as another loud thump came from the direction of the door. Her eyes widened and she rushed to the security cameras. The cloudy days had made their solar power stretched thin, so she’d kept most of them off, but not the ones facing the bunker’s doorway and hatch above. What she saw made her wish she’d never looked. Standing in the stairway leading to the bunker’s main door, were three people she knew. They’d all taken the survival class her dad offered and that Katie helped him teach. Patrick and Veronica Petersen and their son Jon were standing outside, banging on the door. Fear was all over their faces, but that wasn’t all. 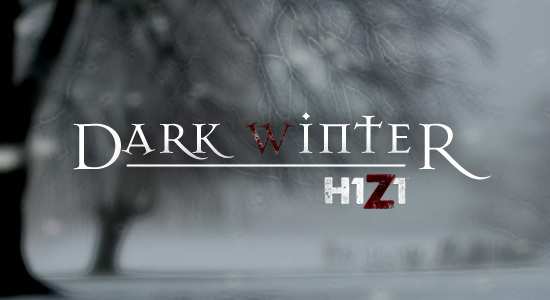 This entry was posted in Dark Winter, Fan Fiction and tagged Dark Winter, H1Z1, Mike Kern, SOE, Survival Horror, Zombie Apocalypse, zombies. Bookmark the permalink.